It's NOT In My Head!!!! Some of this stuff I can still do, but not at the level I did them when I was young. Some, like skating, I have no business doing. Especially now that I have osteopenia, and have a family history of osteoporosis. Don't want to break any bones...then I could possibly do less than what I do now. When I was young, staying at a healthy weight was much easier. Not just because I was more active, because I think I'm pretty active now. My weight issues actually started just after I had my first child. I've had four children, and I did not gain over 30 pounds, so that's good. The problem is, I have not been able to get rid of it after. My youngest is now 22, and I still have much of that baby fat. Over the years, my weight has gone up and down, but I have never been able to get down to what I was BC...before children. I know many women face this same issue. Now, I do know there are some that don't have weight issues, and they are the lucky ones. I am now 57 years old, and have gone through that change...you know...menopause....ugh! Actually it wasn't all that bad for me. It's just that I battle the hormone issue. I don't get hot flashes, though, I get what my husband says are...."cold flashes." Yes, I am cold all the time. Now that I have gone through that change in life, weight is even more of an issue. I have all kinds of people telling me that I'm not fat. Well, it's all in perspective. I'm not going to tell you how much I weigh, or what size I wear, but I will tell you this...in order to get to my BC size, I'd have to lose almost 50 pounds. I don't feel I need to lose that much because, to be honest, I would not look healthy. When I was in my early 20's, I looked great! I was a dancer, and kept in top shape, and I had a lot of muscle. Today, though, I have a lot of flab that I can hide under clothing. So, what do I do? What can we do? I have tried all kinds of things. I've been on different diets....Weight Watchers, LA Weightloss, and on my own--being careful what goes into my mouth. I've been successful, but not for long. Along with these diets, I have exercised. Even when I don't "diet" I still exercise. When I had access to a gym pool, you could find me in there everyday. After my Pilates or Yoga class of an hour, I would go to the pool and swim a mile. Then, I'd go to the deep-in and tread water for sometimes as long as an hour. I did this Monday through Friday. In addition, on Tuesdays and Thursdays, I went to an hour of water aerobics. Did I lose weight or inches? Nope! Now that I do not have access to a pool, I have found some dance classes to go to. I line or tap dance Monday through Thursday...one to three hours each day. Have I lost weight or inches? Nope! Having hypoglycemia, I eat about six small meals a day. I try to stay away from sugar and white flour, but still have not been successful in losing those nasty inches. To say the least, I have been very frustrated. Ok, so, why am I writing this post? Well...I had someone tell me that I could lose and get into shape if I would try harder (by the way this was a man). That all this stuff I have mentioned is in my head. REALLY!!! NOPE it's in my gut! Being involved in the dance world all my life and having a mother and daughter that are pretty much a health nuts, I know the things we are suppose to do to be at a healthy size. Sometimes, though those things do not work. Sure, walking is suppose to be great. Take your dog for a walk, I was told. Guess what, I did that. For six year (this was pre swimming at the gym days), I walked 4 miles in under an hour. Still at the same size. Jokingly, I said, "I could eat nothing and spend 24/7 in heavy exercise and still gain weight." I was then told, oh!!!! you have to eat to lose. This is true, you do, but I was JOKING!!!!! I was being sarcastic! I'm sorry, for this rant, but I get so frustrated about the weight issue. Maybe it's because of my dance background. As a dancer, it is drilled into you that you have to look a certain way, and that is small and in good shape. Now, all this being said, I would NEVER, NEVER give up any of my children for a skinny body. Even if I were to be 100 pounds overweight, I would not forgo having my beautiful family. They are my life, and life without them would be nothing. My point in writing this blog, is twofold. One....is there a way to be in better shape? Even though I dance A LOT, I have major foot issues...bunions, bone spurs, plantar fasciitis, neuropathia, and my feet hurt much of the time that I am on them. But I want to move, and I just dance through it. Even eating a healthy diet, there are so many of us that are overweight. Is is our non food? I call it that because of all the GMO's...but that is all for another blog. Second...those of you who have or think you have the perfect body, do not judge the rest of us because of the way we look. Sometimes it is not "in our head." Bearing children, menopause, medication, thyroid issues, and other medical issues can get in the way of a healthy body. Sure many of these things can be taken care of, but sometimes, even after one has done everything in their power to combat weight or even other health issues (like acne), sometimes, it is just not enough. Love yourself, love others....no matter what! Boat Squadron Black Eyed Peas! Happy New Year to everyone! I can't believe that we are now into 2017. During this time of year....Holidays (Halloween, Thanksgiving, Christmas or Hanukkah, and New Years), comes a lot of family traditions. 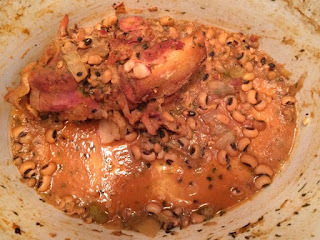 One of many traditions that we observe is to have black eyed peas on New Year's Day. Why? Well, in the South, we claim that if you have your black eyed peas, you will have good luck throughout the year. Growing up, my dad was always in charge of making the black eyed peas. When he and Mom were first married, he was in the Air Force and stationed at Eglin Air Force Base in Florida. He was part of the boat squadron, and spent a lot of time traveling along the coast of Florida...Gulf Coast and Atlantic Coast. One of the things they ate regularly were black eyed peas, and so this made it into our one of our family traditions. Now that I'm married and have children of my own, I make this same dish for our family. We just got finished eating some, and they are pretty much gone. That tells you something....they are SOOOO good!!!! By the way, I really don't measure anything in this recipe, I just eyeball it. I have learned, though, that you don't want to overcook or over season them. Oh, and the crockpot is the best way to cook these! First, you want to soak your beans overnight (16oz dried beads in a bag). Put them in a pan, cover with water and set aside. In the morning, drain, rinse and put them into the crockpot. Cover the beans with water. Add a big onion, a couple stalks of celery, salt, and a few cloves of garlic. You will also need a hamhock. This is why I like to do a ham at Christmas. I freeze it until New Years. Just place that hamhock on top of your beans, cover and turn on your crockpot. I put my pot on low. Each crockpot is different, so keep that in mind. We had church today, and we were gone for about 3 hours. When we came home, the house smelled so delicious! So, the next thing you do is add chili powder, parsley, and a few (2 to 3) squirts of ketchup. Mix it up, put the lid back on, and while I mixed up and cooked my cornbread, those beans, hamhock, and seasonings just "married" together. That probably took about 45 minutes.